Five new John Deere ZTrac Z300 mowers will be available in February 2017, specced to suit a range of budgets. Suited to smaller properties and with a varying range of power, the new additions are the Z335M, Z345M, Z345R, Z355R and Z375R. The Z300 series mowers will be able to have the Accel Deep mower deck fitted, with 107cm, 122cm and 137cm cutting widths available. 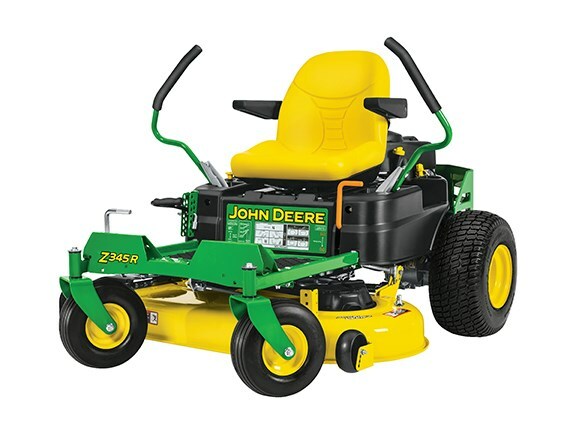 These mower decks will provide homeowners with better grass dispersion and improved cut quality at faster ground speeds, according to John Deere. They’re also compatible with John Deere’s MulchControl kit, which allows operators to switch between side discharge and mulching using a lever. John Deere tactical marketing manager Kim Ridel says the new models will be more accommodatingly priced for buyers who are looking for a better budget option. "Homeowners are attracted to the speed and overall performance of zero-turn radius mowers, but some perceive ZTRs as too expensive," Ridel says. "New for 2017, we’re introducing five new residential zero-turn models priced to provide homeowners with the speed and performance they need, at the attractive price they want." John Deere says many of the improvements for the ZTrak Z300 series are aimed at improving operator comfort and convenience. "Comfort enhancements will be noticed across models, such as those on the Z345R, including a medium back seat that doesn’t require a tool for seat adjustment, control levers with improved ergonomics, and standard floor mats," the company says. John Deere has also improved the tyre options to allow for a smoother ride, and has provided an optional foot-operated deck lift to engage the deck without leaving the seat. "The ZTrak Z300 series also receives an upgrade in engine performance with horsepower ranging from 20hp on the Z335E up to 25hp on the Z375R," John Deere says. The company says customers will be able to place orders for the new series of mowers from February 2017.